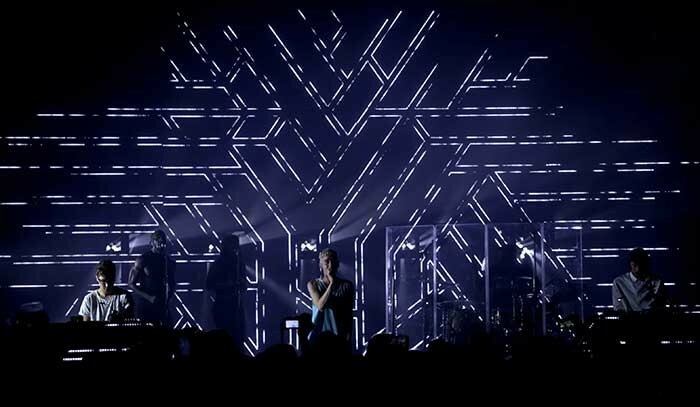 UK – Controllable LED specialist and design/manufacturing house Light Initiative (LI) is the creative force behind the bespoke LED structured screen on band of the moment Years and Years' UK tour and summer festival dates. Commissioned by the band's lighting designer Squib Swain, the screen is based on the vibrant album artwork for their debut offering 'Communion'. The striking image comprises lines branching and intersecting at different angles from a central 'Y' shape. "As the album artwork is such a strong visual image, it was fairly obvious we had to create some sort of 3D version of it for the live shows," says Squib. "Light Initiative created a unique set piece that turned my vision into a reality. It makes such an impact with the crowd." Light Initiative expanded the album cover outwards and extrapolated the lines to create a wider screen that stood five metres high. Cleverly constructed in sections with cut out panels, the overall weight is kept down for ease of transport and assembly whilst allowing Squib's backlighting to shine through. "The Light Initiative guys were great at coming up with solutions to the many challenges I chucked their way," continues Squib. "These included fitting the screen into suitable freighting dimensions, making sure light could stream through from behind and for it to be ground supported and free-standing with short festival turnarounds in mind. You could tell that they were excited by the project and a lot of creativity flowed from them." Beat-perfect content devised by Adam Young is powered through the structure by an Avolites Ai Infinity EX series, bringing Light Initiative's stunning bespoke structure to life. "Once Squib and I had decided on the shape of the structure I pulled the design out of illustrator and into Cinema4D, made it our desired size and emailed it over to LI. The team there just latch onto a crazy idea, completely get what you're trying to achieve and go out of their way to ensure it happens," says Young. Young's content makes the most out of the screen's lined structure, with effects such as chasing pulses across individual branches. The looks are varied and slick, working in harmony with Squib's lighting to keep the audience absorbed throughout the show. "The way LI approached the project made it very easy for me to work," continues Young. "The combination of the amazingly skilled team and the Ai server meant they could simply provide me with a perfect visual representation of the structure and its parts to work on in After Effects. For a designer, this means that you don't have to worry about how you're driving the LED strips and all of your focus can be on bringing the structure to life. "I also didn't have to spend rehearsals tweaking the content to work with the refresh rate of the LED – the colours were perfectly represented from my screen to the structure and the refresh rate was ideal." Light Initiative's Paul Bellman comments: "In effect, at Light Initiative we took a conceptual image through to a finished tour-able product, managing the research and development stages, and offering the client massive visual impact for their budget. We are proud to be part of such a fantastic tour and festival run." 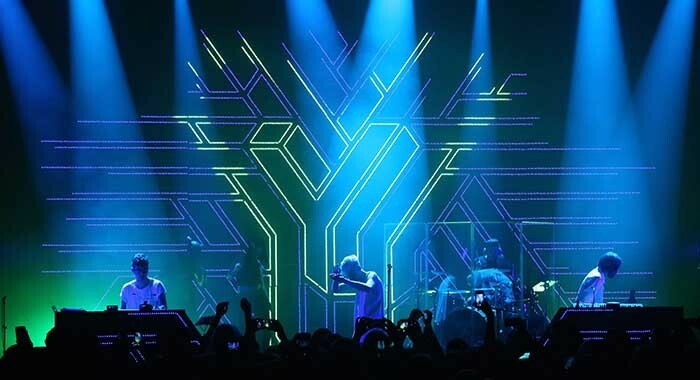 Years and Years have played a number of UK festivals this summer including Glastonbury, with further upcoming dates at Latitude and Reading and at festivals across Europe and Australia.